The animal, and especially a "primitive" creature, is used in movies as a powerful symbol for our subconscious emotions and irrational behaviour, it represents the most primitive instincts of survival - nourishment and sexual reproduction - that are in modern men controlled (maybe even suppressed) by rationality and society. "Quatermass and the Pit" was in origin a black and white science-fiction/horror TV-serial broadcasted in 1958 and 1959. The story based on a script by Nigel Kneale was later adapted by the British Hammer Film Productions (a company notoriously known for its B-movies) to a movie with same title (1967). Curiously in the U.S. the film was released under the title "Five Million Years to Earth" and in Germany "Das grüne Blut der Dämonen" ("The green blood of the demons", probably influenced by one autopsy scene). The movie story follows on a first glance only loosely the classic monster story and uses an intriguing variation of the monster as symbol of primitive behaviour. During construction works in London bones and skulls were uncovered, the anthropologist Dr. Roney discovers the fossils are of a particular breed of primate, much older than all the genera previously known to science. Meanwhile the archaeological survey is interrupted by what appears to be the discovery of an unknown bomb-rocket of World War II, strangely embedded in the same geological strata as the fossils. The army is informed and General Breen seeks the aid of rocket scientist professor Quatermass. He will soon discover the terrible truth: the supposed rocket is an alien spacecraft. The hypothesis presented by the scientists: 5 millions of years ago a superior race of Martian insects tried to create a race of slaves from primitive monkeys, bursting the evolution of mankind. But before the aliens succeeded in their plan they annihilated themselves in a terrible eugenic war in a distant past. In fact the reconstruction, based on the fossils and modelled in an extraordinary short time interval by Dr. Roney, shows a giant monkey with a big head, the classic missing link between man and animal (even Piltdown man is mentioned in the technobabble of some scenes of the TV-serial) in accordance to the classic "ladder of evolution" of man. The reconstruction with a large brain resembles also a bit to much modern humans, according to the real fossil record five million years the genus Australopithecus would be a more realistic approach, a bipedal primate with not to unusual characteristics in cranial volume. In contrast to a classic monster movie in Quatermass and the Pit the discovered fossils remain however dead - there is no physical reanimation and a rampage of classic ape-men trough London. But the discovery of the ancient spaceship has started by telepathic influence also a self-destruction program in the genes of the descendants of the first ape-men - We are the monsters! By following the most primitive instinct and survival of the strongest humans begin to kill each other, like the Martian million years ago. The movie also cites and shows in form of the war that destroyed the aliens the dangers of a worldwide nuclear threat and armament - a common topic in monster movies of the sixties and seventies. Interesting the decision to gave the Martian the aspect of locusts (but the comparison of the sorcerer of Les Trois Frères is farfetched), maybe to represent the human behaviour of colonizing and overexploiting new land ? 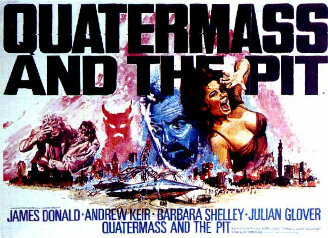 Quatermass and the Pit is not the classic monster movie of the sixties. The first half builds up suspense and then it develops from a science-fiction story to a ghost-horror movie, even with the classic demonic possession scene. The Martian technology is capable to control human minds, taking from us our personality transforming us in a single mob - also the attacks comes from the most unsuspected side, the common people on the street. It's surely one of the better and more serious Hammer films. The idea that life on earth, especially the rise of man, can be explained by the intervention of aliens is still used in science fiction today (a recent example is the film "Mission to Mars" in 2000) - ironically that some authors copied this idea even for their pseudo-serious books about Paleoseti in recent years. Totally love this movie - my dad showed it to me (and now I realise that was a mere six years after it came out!) and I managed to track down a copy of the TV serial too. (It has the first screen appearance of John Hamblin, who made his name later on Australian "Play School"). If only we could get copies of the other Kneale TV serials. I've got a DVD of "The Quatermass Conclusion" somewhere too. Nigel Kneale had a very deft touch with science fiction.